I was a little too excited yesterday to have a whole bunch of candy at my disposal. I gave a lot of samples away to people but I just kept eating it over and over and over. It was delicious - but I think the excessive sweet has gone to my brain and the result is a headache. It's not terrible - but this just confirms that too much of any one thing (especially sugar - or in this case honey) is never very good. I tried drowning my headache with excessive water consumption and of course - eating green vegetables and some rice and fish - but once it starts I think it just has to run its course. Regardless, a headache puts me into a bad mood and makes me not want to be on the Survivor Diet. My supply of fish is starting to run low. I need to make it to Saturday when fluke season opens. I know how to catch lots of them. And they are very easy to prepare in a variety of ways. For now I'm still surviving off what I caught last week. I didn't freeze any but in hindsight I should have vacuum packed a few pieces when I had excess. When I smoke it - I just eat it all. I think I have a problem with moderation! Debbie tells me that all the time and it becomes very clear as soon as I make something that I really like. Like candy. Well, I am grateful to now have my week 2 reward (10 days late) after successfully making fire Saturday. I will put these to good use and try to moderate my consumption. 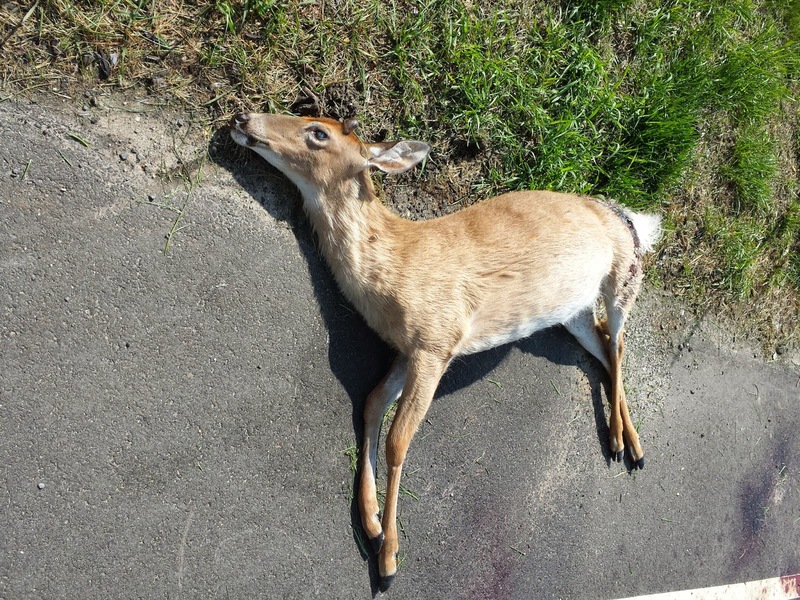 I drove past a road killed deer today. It looked freshly killed so I stopped my truck to check it out. It was very obvious, upon further inspection, that it had been dead for a while. No scavenging today - but if I ever do witness a fresh kill, I would definitely attempt to get some meat from it. I haven't done that yet on the Survivor Diet Challenge but it could happen at any time. Maybe I should drive around at night when I'm bored. I will be working on Wednesday this week so I will not have my normal mid week break to try to gather food. On the plus side, I will have a 4 day weekend for Memorial Day - just have to survive until then. Day 36 - Stop. Thief! Day 8 - Fish for Dinner Tonight!